My last post mentioned resellers in the plants and edibles section on etsy, and Modish published an interview partially describing the situation. And now for something completely different! Flowers. 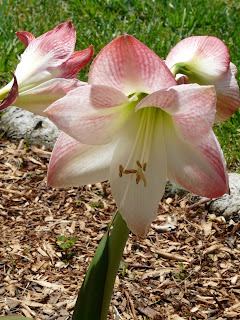 Here's an amaryllis that I got from my mother. They're everywhere around her home, and her beds are always overflowing with the lovelies. Sadly, I have to dig them up every fall, but I wouldn't be without them! This prized specimen was 8.75" across! I was impressed.